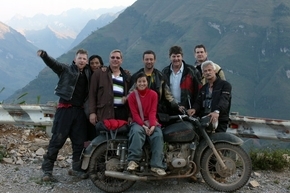 We wanted to ride Vietnam from Hanoi to the Chinese border but not on Minsks. We all ride bikes and the thought of riding a Minsk ( my parents used them in Indonesia) did not really appeal to us however a friend of ours, an expat, in Hanoi said he knew of an outfit that deals in Urals. He bought two Ural motorcycle from him. A Ural is a 670cc Russian version of a 1958 BMW (post war, nothing is different about these, and nothing has changed since then). So we contacted Explore Indochina which provided some ideas and routes. We did not want to go where the tourists gathered, so we agreed to go north to the Chinese border, see the top end and train it back to Hanoi. First day we rode to Ba Be, a most beautiful ride, with a large natural lake. Day 2 we rode to Ha Giang, then onto Dong Van. We stayed a day touring around Dong Van going to a Hmong hill tribe market, and to the most northern tip of Vietnam, Lung Co.
Next day we rode to the Pan Hou Eco Resort, in Hoang Su Phi. A really top spot in Vietnam. We rested and took it easy with another visit to a local market. A short ride that afternoon to Xin Man. The last day was a ride to Lao Cai to catch a 9.30pm train back to Hanoi. The guide had the timing right and we made every stop without fuss or panic. The scenery was out of this world, hilly, some places rough, green. Our bikes broke sometimes, and I must admit that was part of the experience. Repairing flat tyres, replacing clutch cables, electrical problems was just part of the course. When something went wrong the mechanic seemed to appear from nowhere to help. When we fell over in the mud at landslides, he was there to pick up the bikes with us, when a motor would not start he was there to start it for us, he was everywhere, and he was always there with a smile. I now find out/understand that the Vietnamese people don’t really get angry. In conclusion, I recommend Explore Indochina. Being under constant pressure as professional, this trip was such a release for us, it was unbelievable, a real highlight. I am sure you would aslo enjoy it.